Arrive Delhi, meet & assistance at the airport & transfer to the hotel. Night stay at Delhi. Morning after breakfast proceed for city sightseeing tour of Delhi visiting Old & New Delhi. OLD DELHI - A sightseeing tour of Old Delhi would entail visiting the Raj Ghat - the memorial site where Mahatma Gandhi was cremated; Jama Masjid - the largest mosque in India. NEW DELHI - An extensive sight-seeing tour of New Delhi would include a visit to the Qutub Minar, a drive along the ceremonial avenue - Rajpath, past the imposing India Gate, Parliament House, and the President's Residence and would end with a drive through the Diplomatic Enclave. Night stay in Delhi. Morning after breakfast and drive to Mandawa. Arrive Mandawa & check-in hotel. Later proceed for city sightseeing tour of Mandawa, founded 1755 by Thakur Nawal Singh and still the home of his descendants has beautiful frescoes, Havelis and mansions. Mandawa castle one of the finest castles of Rajasthan, is now a hotel and house of collection of armories, costumes of ancestors, canons from 1820 ancient coins, numismatic collection and many other interesting items, preserved in a museum. Night stay at Mandawa. Morning after breakfast and drive to Bikaner. Arrive Bikaner & check-in hotel. Rest of the day at leisure. Night stay at Bikaner. Morning after breakfast and drive to Khimsar. Later proceed for city sightseeing tour of Bikaner. Bikaner is named after its founder Rao Bika Ji in 1488. But long before this, the city was trade center on the caravan routes from Africa and West Asia. Bikaner's dominant features are rippling sands and abundant sunshine. The city stands on an elevation, enclosed by a 7 Kms wall, which can be entered from 5 gates. Bikaner City is bolstered by imposing walls and has a 16th century fort housing old palaces, temples and mosque. Founded by Raja Rai Singh the fort is distinguished by its long range of 37 pavilions, a line of balconies and aerial windows of varying designs. Also visit Lallgarh Palace, the museum, and Bhanda Sagar Jain and Deshnoke Rat temple. After sightseeing continue drive to Khimsar. Arrive Khimsar & check-in hotel. Night stay at Khimsar. Morning after breakfast proceed for city sightseeing tour of Khimsar. Khimsar is steeped in history- founded 2500 years ago by the Jain Saint Mahaveer, this is the starting point of the great Indian Desert tours. The founder of the castle, which was built in mid 15th century, was Prince Karamsi, son of Jodhpur and very close to other places of interest like Osian and Nagaur. Well managed Khimsar Fort provides for the visitors with all modern amenities- 50 luxuriously furnished rooms, theme dinners, variety of continental and Indian meals as well as traditional Rajasthani are available. Enjoy Jeep Safari. Night stay at Khimsar. Morning after breakfast and drive to Nagaur. Arrive Nagaur & check-in hotel. Later proceed for city sightseeing tour of Nagaur. Nagaur Fort-built in the 10th century. The Nagaur is famous for the second largest cattle fair and known also “Nagaur fair” in India held every year during the Hindu month of Magh (Jan-Feb) for ref. please see festival calendar, whose basic purpose is cattle trading. Night stay at Nagaur. Morning after breakfast and drive to Roopangarh. Arrive Roopangarh & check-in hotel. Later proceed for city sightseeing tour of Roopangarh is a small town which is situated in the Rajasthan. This place has gained popularity due to the most famous Roopangarh fort. 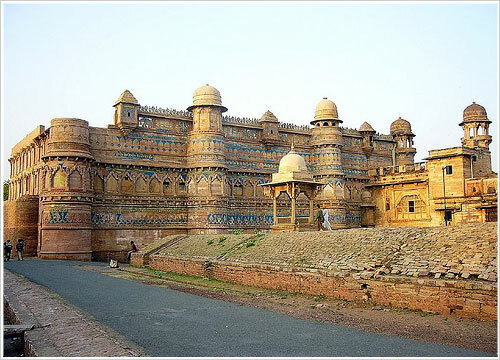 Roopangarh fort is well-known for its magnificent and royal look. It is now converted into a heritage hotel. This fortress was built by Maharaja Roop Singh of Kishangarh in year 1648. It is a sheer display of royal and ancient architecture. Moreover, one can also take the Camel or Horse safari to explore more about the land or indulge in some good traditional music, folk dances and cultural shows held regularly at the hotel premises. Night stay at Roopangarh. Morning after breakfast and drive to Pushkar. Arrive Pushkar & check-in hotel. 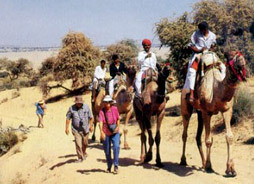 Later proceed for city sightseeing tour of Pushkar. Visit Pushkar boasts temples, though few are as ancient as you might expect at such an important pilgrimage site, since many were deserted by Aurangzeb and subsequently rebuilt. The most famous is the Brahma Temple, said to be one of the few temples in the world dedicated to this deity. It's marked by red spire, and over the entrance gateway is the hans, or goose symbol of Brahma, who is said to have personally chosen Pushkar as its site. Night stay at Pushkar. Morning after breakfast and drive to Samode. Arrive Samode & check-in hotel. Rest of the day at leisure. Night stay at Samode. Morning after breakfast proceed for city sightseeing tour of Samode. 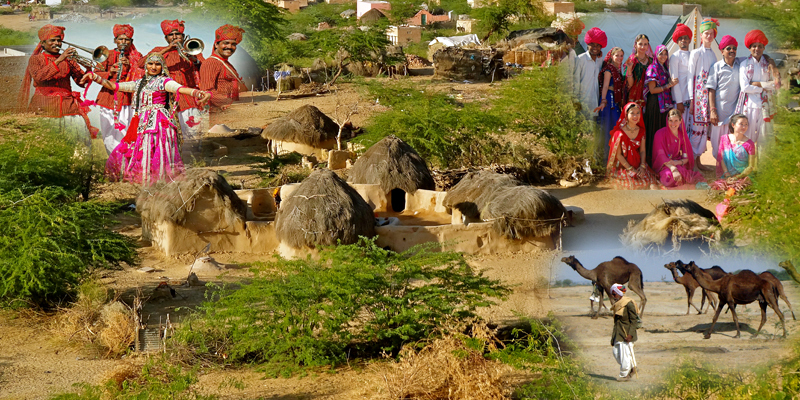 At Samode, you may have an enjoying camel ride over the sand dunes or explore the heritage character of the village. Evening at leisure watching cultural performances. The Samode Palace displays the excellence of Rajasthani architecture. It is built in that pattern of an open courtyard with rooms leading off the arched corridor that runs along all the four sides of building. The painstakingly carved Sultan Mahal reflects an artists Zest for creativity and excellence. Durbar Hall is painted with Ornate floral motifis and colored delicately with vegetable pigments carries a charm of its own. Night stay at Samode. Morning after breakfast and drive to Neemrana. Arrive Neemrana & check-in hotel. Later proceed for city sightseeing tour of Neemrana. The Neemrana Fort is situated on a majestic plateau concealed in a horseshoe formation of the Aravali ranges, considered the oldest fold mountains in the world. Night stay at Neemrana. Morning after breakfast and drive to Delhi departure transfer to the airport to board the flight for onward journey. Tour ends with sweet memories.